This exercise is about the Simpson family and contains 2 exercises: one gap-filling ex in which pupils have to fill in the rooms of the house. 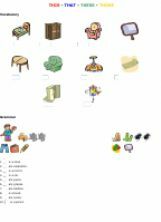 The second ex is about furniture and kitchen appliances. 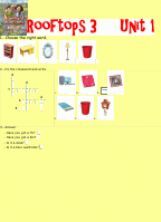 The pupils look at the pictures and complete the text (also gap-filling) about the pieces of furniture. 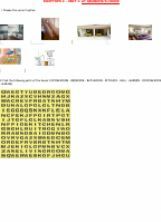 Some of those words are numbered, which makes it easier, but others are to be derived from the context and the pictures. Therefore they have to read carefully. Hope you (and your students) will enjoy it! 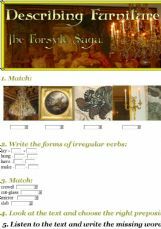 A listening exercise based on an extract from John Gasworthy�s novel The Forsyte Saga. 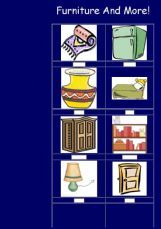 This exercise is for revising the topic "House and Furniture". The pupils revise the vocabulary, concerning this topic and revise such grammar topics as irregular verbs and prepositions of place. Furniture and other objects in the house. Guess the word. The first letter is given in the hint. Simple exercise to revise demonstratives. 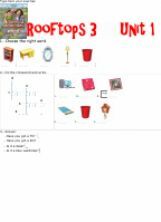 Some few easy exercises to practise vocabulary and grammmar of Rooftops 3.